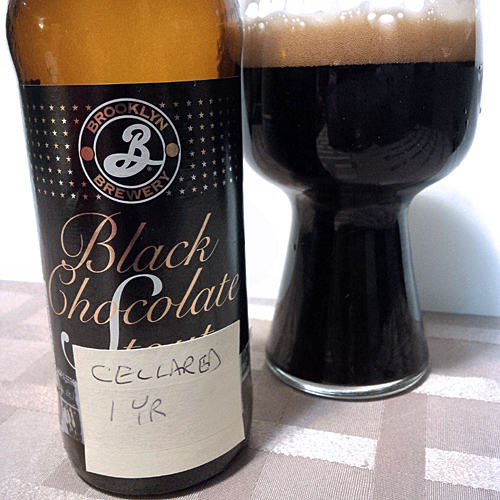 Brooklyn Brewing Black Chocolate Stout (Aged 1 Year): This is one of those beers that I have seen on the shelf year over year and never picked up, yet low and behold I got it on the first day of my Beer Advent Calendar Exchange with my father. You see my dad and I in years past have gotten some pre-made beer advents before, but this year we decided to try and make them for each other by searching for beers that neither one of us has had and packaged them up into an advent calendars that we exchanged shortly before December 1st. This will have to be an every year event simply because it was so much fun to put together, let alone enjoy every day in December leading up until Christmas. This particular beer has been cellared for a years time, being that it is an Imperial Stout it can last quite a long time. Aroma and Appearance: It poured a dark brown colour with one finger of light brown foam and no carbonation at all while featuring an aroma of dark chocolate truffles and cocoa powder. Flavour: All kinds of chocolate going on here, dark chocolate, cocoa, chocolate truffles, chocolate liqueur, and finally a bitter dark coffee mocha finish. Overall Impression: I would say this is the richest chocolate beer I have ever had. Rating: Quite nice and balanced chocolate flavours that lead to an excellent rating of 8/10. Food Pairing: More chocolate perhaps? Actually I would go with some festive shortbread cookies to kick off the season. Brooklyn Brewing has really made a name for themselves over the years, here is a talk that one of the co-founders of Brooklyn Brewery named Steve Hindy gave at Google Talks about how the early craft brewers banded together to shape the craft beer world we know today. This is an hour long chat, honestly it’s a fantastic history lesson so be sure to bookmark it or watch it right now.